Annette | Robert S. Minch, D.D.S., P.A. 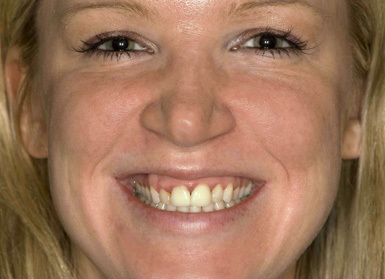 The patient was very unhappy with her gummy smile and two front teeth with old, misshapen porcelain veneers. Plastic surgery was performed on her gums followed by home bleaching and new, Durathin (no prep) porcelain veneers on her upper 10 teeth. Click here to see a close up view.